What Do You Think About Dealertrack Acquiring Dealer.com? Dealertrack Acquires Dealer.com – What Do Automotive Professionals Think? The biggest news of automotive M&A came at the end of the year as Dealertrack has agreed to acquire Dealer.com. Following their acquisition of ClickMotive earlier in the year, I’m wondering what the Car Peeps community thinks of the acquisition. Lake Success, N.Y. and Burlington, Vt., December 19, 2013 – Dealertrack Technologies (Nasdaq: TRAK) and Dealer.com today announced a definitive agreement for Dealertrack to acquire Dealer.com, a leading provider of marketing and operations software and services for the automotive industry. Through the combination, the companies expect to realize their shared vision to transform automotive retail by delivering the most advanced solutions for dealers, OEMs, lenders and car shoppers. Under the terms of the agreement, Dealertrack will acquire all the equity of Dealer.com for approximately 8.7 million shares of Dealertrack’s common stock and $620 million in cash, subject to customary post-closing adjustments. Dealertrack expects to finance the cash portion of the purchase price through cash on hand and with fully committed debt financing. The deal is expected to close in the first quarter of 2014, subject to regulatory approval, and the transaction is expected to be accretive to Dealertrack’s standalone multi-year organic growth profile to Dealertrack’s diluted adjusted net income per share. Established in 1998, Dealer.com is a pioneer in bringing automotive dealerships online. The company has grown to 830 employees across its Burlington, Vermont, headquarters and Manhattan Beach, California, office, and serves approximately 7,000 U.S. dealers with its integrated suite of products. Dealer.com expects to generate annual revenue in excess of $230 million for 2013, representing year-on-year growth in excess of 25 percent relative to 2012. Dealertrack places a high value on the culture of creativity and innovation that has been the hallmark of Dealer.com, and plans to establish Dealer.com’s Burlington, Vermont, headquarters as a center of excellence for digital marketing solutions, along with Dealertrack’s Dallas, Texas, office. Based on the strength of Dealer.com’s brand, Dealertrack will retain the Dealer.com name in the marketplace to represent Dealertrack’s advanced and complementary set of digital marketing products and services. Upon closing, Gibbs will become Executive Vice President and Group President of Dealertrack’s Digital Marketing solution team. In connection with the transaction, Evercore acted as financial advisor and O’Melveny & Myers LLP provided legal advice to Dealertrack. Goldman Sachs & Co. acted as financial advisor and Wilson Sonsini Goodrich & Rosati, Professional Corporation, provided legal advice to Dealer.com. J.P. Morgan, B of A Merrill Lynch, Barclays and Wells Fargo are providing Dealertrack’s committed debt financing for the transaction. Dealertrack will host a conference call to discuss this announcement on December 19, 2013 at 6:00 p.m. Eastern Time. The conference call will be webcast live on the Internet at ir.dealertrack.com, where a supplementary presentation is also available. In addition, a live audio of the call will be accessible to the public by calling 877-303-6648 (domestic) or 970-315-0443 (international); no access code is necessary. Callers should dial in approximately 10 minutes before the call begins. A replay will be available on the Dealertrack website until March 19, 2014. Dealertrack Technologies’ intuitive and high-value web-based software solutions and services enhance efficiency and profitability for all major segments of the automotive retail industry, including dealers, lenders, OEMs, third-party retailers, agents and aftermarket providers. In addition to the industry’s largest online credit application network, connecting more than 20,000 dealers with more than 1,400 lenders, Dealertrack Technologies delivers the industry’s most comprehensive solution set for automotive retailers, including Dealer Management, Inventory, Sales and F&I,Interactive and Registration and Titling solutions. Dealer.com is the automotive industry’s leading provider of a streamlined and intuitive solution for managing dealership marketing and operations. The company’s platform-based Inventory, Advertising, Website and CRM products allow OEMs, dealer groups, retail and agencies to leverage innovative technology to relevantly connect to their customers. The company’s unique commitment to culture, with a focus on health and wellness, makes it one of the most desirable places to work. Statements in this press release regarding the benefits of the Dealertrack, Dealer.com and all other statements in this release other than the recitation of historical facts are forward-looking statements (as defined in the Private Securities Litigation Reform Act of 1995). These statements involve a number of risks, uncertainties and other factors that could cause actual results, performance or achievements of Dealertrack Technologies to be materially different from any future results, performance or achievements expressed or implied by these forward-looking statements. Factors that might cause such a difference include the performance and acceptance of the Dealertrack, Dealer.com and their solutions, and other risks listed in our reports filed with the Securities and Exchange Commission (SEC), including our Annual Report on Form 10-K for the year ending December 31, 2012 and our Quarterly Reports on Form 10-Q. These filings can be found on Dealertrack Technologies’ website at www.dealertrack.com and the SEC’s website atwww.sec.gov. Forward-looking statements included herein speak only as of the date hereof and Dealertrack Technologies disclaims any obligation to revise or update such statements to reflect events or circumstances after the date hereof or to reflect the occurrence of unanticipated events or circumstances. Have Dealers Had Enough of New Mouse Traps, Evangelical Trainers, Etc.? Car Dealer Website Live Chat vs. Contact Form: What Is The Difference? Live Chat vs. Contact Form: is there really a difference? The difference between a contact form and live chat is that chat is, well, LIVE. Much more than a virtual answering service for your phones, a good chat operator can guide visitors through the website (including inventory), set appointments, provide Edmunds.com data about vehicles or CarFax reports up to twenty-four hours a day (with participating dealers and select live chat providers), and much more. The live chat operator becomes a car shopper’s ‘concierge in the cloud’. Read the rest of the article at the source via Automotive Digital Marketing Professional Community. It’s here — the turn of the new year. And you know what that means… This is your chance to reboot and decide what changes you’ll make in 2013. Are there specific skills you haven’t quite mastered yet? Do you have a particular goal in mind that you weren’t quite able to hit in 2012? Of course, these goals could pertain to your personal life, but what about some career and marketing-related goals, too? Why not improve some critical skills and habits that could advance your marketing career and make you an even stronger contributor to your company’s success? What marketing resolutions do you want to make? 1) I will blog at least twice a week. Did you know that, according to HubSpot’s 2012 Marketing Benchmarketing Report, companies that blog 6-8 times per month generate over 2X more leads than companies that blog just twice a month? Valuable content is the meat that attracts visitors and leads to your company. Making the commitment to an increased blogging frequency should significantly increase your lead flow. Considering adding this to your list of resolutions? Here are 10 ways to never run out of blog ideas again. 2) I will produce at least one video in Q1, and post it on YouTube. Video content can communicate a story or emotion better than almost any other form of content. A lot of marketers have a mental block that keeps them from creating video content due to a lack of technical savvy or resources. Kick those excuses to the curb and use this goal to tell one of your customers’ success stories — it could become the strongest selling tool in your sales reps’ tool belt. 3) I will become an active contributor to social media by posting articles to my company’s social channels. Maintaining an active, helpful social presence is a great tool for growing a reach that can be used to promote your best content. If this is a current weakness of yours, start by making a commitment to sharing others’ content so you can grow that valuable following. Need help planning your social media updates? Check out our free social media publishing schedule template. 4) I will work to enhance my and/or my team’s design skills. This resolution is especially relevant for 2013. A recent HubSpot study found that photos on Facebook generate 53% more Likes than text, and the trend toward visual content is only growing in importance. In 2013, investing in design skill development will be crucial for creating effective content for social media and other marketing channels. Purchase Photoshop for your team, ask a designer to host a short design tutorial, spruce up your PowerPoint skills, and download our 35 free email design templates — or check out these awesome, free design tools — if you’re a marketer on a budget. There are a lot of ways to become a better designer. Take advantage of them! 5) I will take the time to conduct a website audit in 2013. When’s the last time your website got a checkup? If it’s been a while, there could be plenty of missed optimization opportunities you never even knew existed. Does your website rank for certain terms that you didn’t know about? Conduct an SEO audit. Are there certain pages on your site that aren’t optimized at all — for search and for conversion? A website audit is a great thing to do early in the year so you reap the benefits throughout 2013. Check out our 25 website must-haves for driving traffic, leads, and sales, so you can start the new year off right with an optimized website. 6) I will take the time to educate myself and my team about the basics of SEO. Speaking of search engine optimization, every inbound marketer should know the basics of SEO. Especially with recent Google algorithm changes, there are some ways you can improve your search engine optimization through improved social performance (that’s right — they’re connected), and more! Download our free on-page SEO template, brush up on link-building best practices, and make sure everyone who creates content on your team keeps SEO best practices in the backs of their minds. 7) I will conduct one landing page A/B test per month to optimize my landing pages. When it comes to lead generation and reconversion, the difference between a 15% landing page conversion rate and a 25% conversion rate can be HUGE. Imagine if you could automatically generate more leads without changing your promotion strategy or generating more traffic — but rather just by optimizing your landing pages themselves? By making a habit of testing your landing pages on a regular basis to get more bang for your buck, you may be able to significantly scale your lead generation without having to scale your team! Check out this guide to landing page A/B testing to learn more — or download our complete ebook on A/B testing. 8) I will get into the habit of doing email A/B tests prior to emailing my list. Similar to the point above, optimizing an email before hitting send could increase open or clickthrough rates immensely. Who knows — maybe the first CTA headline you think of won’t resonate with your email list. But how the heck would you know if you didn’t test it first? Make this a normal practice in your marketing, and check out these various types of email tests you can try with your next email…. And while we’re on the subject of email optimization, you’re segmenting your email list too … right? 9) I promise to set specific, numerical goals for every project I do. Goal setting is an important habit for every marketer in order to both evaluate and communicate their successes. Starting a new video series? What number of views, shares, website visits, or leads do you need to attract to make this initiative worth it? 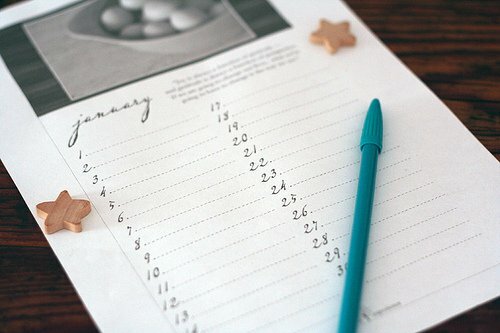 Make this step number one for all your work moving forward, and check out this free template to help you determine your 2013 marketing goals. 10) I will start tracking my analytics every week — if not every day. This is just plain good housekeeping. By keeping a pulse on how your marketing is performing on a regular basis, you can keep yourself from falling behind. A great way to do this is to use a waterfall chart to track your progress toward an end goal. If you get behind early in the month, you’ll know that you need to go full-steam ahead to fix the problem fast so you can still finish strong. Here are some other reports you should set up with your marketing analytics to keep your marketing — and sales — teams accountable. 11) I will commit to tracking my leads to sales, so I truly know what marketing channels work best. “Smarketing” is a beautiful thing. Very easily, we marketers get caught up in measuring success by marketing numbers exclusively, but what works for us might not be what’s best for the business. For example, a marketer at a software company could get 10,000 people to download a flip-book of cute kitty images (Hey, I’d download that! ), but it doesn’t mean those 10,000 people are going to be good fits as customers. Using closed-loop marketing analytics and aligning your marketing goals with sales goals to understand if your content is attracting the right people will help you understand what’s best for the business. 12) I will encourage my team to independently measure their work, and report back to me. Measuring progress doesn’t need to live at the management level exclusively. In fact, it may work to your benefit to encourage data-driven habits at every level as a tool to keep your marketing team accountable. Empower your employees by cultivating a data-driven culture. Help your team understand how they can track their progress, and ask them for updates periodically so it’s always top of mind. 13) I will pick an organization I love and learn from them. Is there a company out there that you admire because of a particular way they do marketing? For instance, maybe you love Oreo’s content in social media. Or maybe you aspire to be as creative as Disney. Dissect WHY you love that organization, and learn from their marketing choices. Even if that company is in a completely different industry, there will likely still be key, valuable takeaways that can help to inspire your own marketing promotions. Start by checking our list of 10 of the most memorable marketing campaigns in 2012. 14) I will further my own education as a marketer by attending conferences and reading smart content every day. Never be too busy to keep learning. Consider attending a couple of top-notch marketing conferences this year. Print marketing ebooks and read them before bed, or read through an RSS reader of your favorite blogs while you sip coffee in your slippers. (Are you subscribed to this one yet, by the way?) You can always make the time. Find ways to keep your brain active and learning, and do the same for your team. Help them find educational resources they enjoy and can read every day, and set a good example by being a lifelong learner yourself. 15) I will accept feedback from my boss, teammates, customers, and community. A closed mind is a stagnant mind. Always be open to feedback when it’s given to you, and request it regularly even when it’s not. Survey your customers and clients to gut check their happiness. You may learn simple ways to make their lives better that make all the difference, yet takes no additional time from you. And, you’ll be improving the impact of your marketing along the way! 16) I will make a commitment to creating marketing that people love. The true path to successful marketing is making sure all the content you make, information you provide, and emails you send make your target market love you. When you create lovable marketing, it will also get clicked on, shared, downloaded, linked to, and promoted more often by your audience. And if you can build rapport and trust in the marketing stages, you’ll be teeing up a relationship that could lead to a lifelong, happy customer. To learn more about creating marketing that people love, check out our step-by-step ebook on lovable marketing here. Since these sites are actively trying to get people in the auto industry to come back to them on a regular basis, it is useful to also examine their total number of visits, which would include members returning for multiple visits throughout each month being tracked. Automotive Digital Marketing has a substantial lead in 1st place for most visitors, with DealerELITE and DrivingSales neck and neck for second most visited automotive professional network. EDITOR’S NOTE: For years I have compared Compete, Inc. data with Google Analytics measured traffic reports for dozens of websites I have access to, and can attest to the fact that Compete always shows LESS TRAFFIC than actual traffic to a website (in absolute raw numbers). However, the relative comparisons of multiple sites by Compete, Inc. is almost always relatively accurate, with the sites that get more traffic according to Compete, also getting more traffic as shown by Google Analytics. However, it is important to note that all data sources show variations and many industry pundits have criticized Compete, Inc. data collection methodologies, despite validation of these same techniques by Google and Google’s partnership with Compete on many research projects. You are currently browsing the archives for the Automotive Suppliers category.